Auto racing is a high pressure, high stakes world where results are measured in the thousands of a second, and small missteps can cost millions of dollars. Great racers have great pit crews. A driver can be an exceptional talent, but if they rely on a slow or error-prone crew, or an inexperienced crew chief, the driver’s chances for success dwindle. 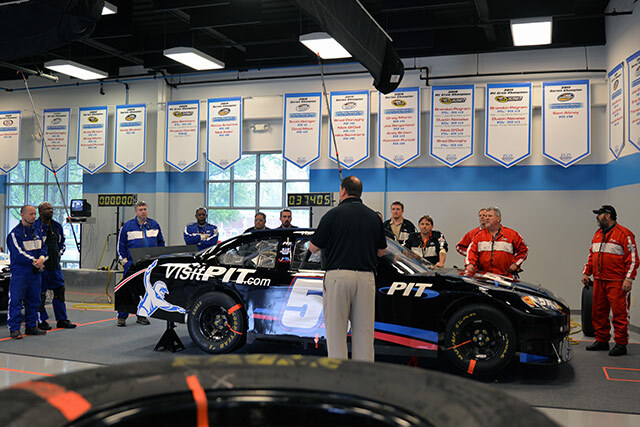 Nineteen engineering professionals that attended the IES-offered April 15 “Pit Crew Simulation” at Pit Crew U in Mooresville, NC quickly discovered those same metrics can be applicable to their companies and to their efforts to compete globally. In a one-of-a-kind combination of classroom presentation, focused team discussion and five rounds of pit stops, three competing “pit crews” progressively worked through the process of utilizing Value Stream Mapping and Rapid Improvement Events to align strategic goals and achieve bottom line results. In a normal pit stop, crew members move in a synchronized pattern to change tires, top off fuel, make chassis adjustments, clean the windshield and more, in less than 14 seconds. Leading teams in the sport can change a full set of new tires in under 12.5 seconds. As in manufacturing, everything that happens must be done exactly as planned. Each crew member must execute his tasks flawlessly so everyone else can complete their tasks without conflicts or interruptions. Precision, speed, training, skill level and lack of errors are essential metrics for a championship caliber team. The pit stop exercises created a “no paradigm” atmosphere allowing participants to focus on continuous improvement, efficiency and preparation, and then apply that knowledge in following simulation rounds. By the end of the half-day session, participants reported on how the Lean principles they’d learned could be further incorporated into their respective workflows and culture, allowing them to reduce process lead times, enhance quality and improve on-time deliveries to their customers. But like the pit crews, participants also learned there should never be a time to assume you are the best. Continuous improvement is necessary because there is always another “race” on the horizon. Manufacturing Market Development Leader Nathan Huret strategically grows the Manufacturing Makes It Real Network and develops unique programming and bringing greater value to manufacturing Members for NC State IES. Nathan graduated with a masters in Economics from Vanderbilt University and received a Bachelors in Economics and International Studies from Elon University.